Being a wine blog, A Long Pour is of course mostly here to serve my ego. In fact, the only reason I didn’t start a blog called: “The Reasons Wayne is So Much Better than You” was that my initial post outlining just the main reasons I am better than you (and I am), was over 13,000 words long! Too much writing for me. So wine it was. Aside from cementing my own legacy in the history of internet blogdom fame, I have actually had the honor to champion a good thing or two on here, namely small family-run wineries and sustainable practices. While sustainable can mean many things and increasingly it seems most wineries are doing something sustainable (many Napa wineries for instance are continuing to sustain an aura of superiority), real sustainability…the hard-core geeked out scientific kind, is a real passion of mine. Stand in a vineyard or two that are crawling with life and vibrancy and you will be converted. Elliot Karpman shares my passion, actually, he excels at it. Elliot and I met in a small beer and wine bar in Solvang over a few glasses last summer. 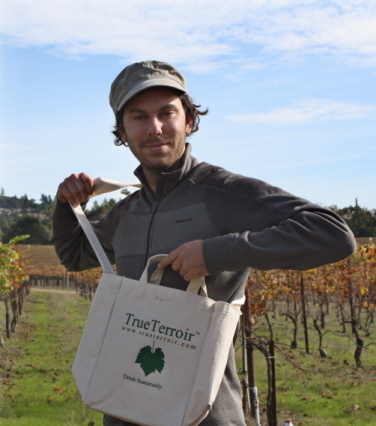 He runs a company called True Terroir, advocating small wineries that are making big impacts in the pursuit of terroir and environmentally friendly practices. He his a devotee to the notion of terroir and believes that real terroir, true terroir, comes from a respect for the land. While we might not see eye to eye on all things wine, I am glad to have voices like his, who rise above the “I’m a Millennial, look at me! Look at me!” schtick, and actually convey real information that anyone can use. So we conclude our conversations with young wine consumers with Elliot. If you missed the others, check out Parts I, II, and III. ALP: What is your relationship with wine? ALP: What are the factors that you look for when picking out a new bottle of wine to try? – Whether or not grapes were grown without chemical inputs (I believe organic and biodynamic vineyards allow for higher quality fruit, as well as a more genuine expression of the unique location in which the fruit is grown). – Price-point. Most of my wine purchases fall in between the $20 – $45 price range. At this moment in time, I truly believe wines within this price range have the ability to offer an equal amount (and often a much greater amount) of drinking enjoyment than wines that cost more than $45. I think this holds true across the globe, but is particularly exemplified in California – where wine marketing and media hype often take center stage. There are, of course, exceptions to my analysis of wine pricing (in terms of its relationship to wine quality), but in my experience/opinion, they are few and far between, and simply not worth the extra cash. – Appellation. I am particularly fascinated by the fact that a unique geographic location of a place will often influence the way a wine tastes. Consequently, the appellation of wine plays a huge part in my purchasing decisions. – Producer. Over the past 10 years I have become very familiar with certain wineries and the style of wines they produce, which ultimately leads me to purchase (or avoid purchasing) certain bottles of wine. – Importer. I’ve found that certain importers (e.g. Kermit Lynch) bring in wines that match my palate profile. Consequently, I often make purchasing decisions based on the importer. – Alcohol. I’ve found that wines with lower alcohol levels tend to pair better with food. I tend to drink most of my wines with food, so the alcohol level of a wine is fairly important to me. Occasionally I will purchase a wine with the intention of drinking it by itself, in which case high alcohol levels will not deter me. But either way, I always make a point to look at a wine’s alcohol level before I purchase it. – Closure. Due to their negative impact on the environment, I avoid purchasing wines that are sealed with a screwtop. ALP: How would you classify the average wine drinker within your age group in your area? ALP: Do you pay much attention to wine scores and if so, whose? – I believe wine, like art, is very subjective in terms of what is good or bad. After working in tasting rooms for a number of years I quickly realized that many of the wines I loved, other people hated (and vice versa). – Wines are usually scored on their ability to impress in a vacuum environment. As I mentioned above, I usually drink my wines with food, which dramatically changes the way a wine shows on the palate. – Scores are significantly influenced by the weight and color of a wine (heavy/dark wines tend to get higher scores than light/translucent wines, which has always baffled me since I enjoy drinking many light/translucent wines just as much as I do heavy/dark wines.